2010 has been undoubtedly the most difficult year of my adult life. In the span of just a few months, my best friend was diagnosed with cancer, my long-term girlfriend left me, Michigan sports were dissolving, I was increasingly unhappy with my job and friends, and I encountered various issues with my car, taxes, and other pitfalls that a poorly paid editor is unfit to deal with financially. At one point, I had a running count of “wins”; 2010 is holding a commanding lead over me. Since then, I quit my job, moved to Los Angeles, have attempted to get over said ex-girlfriend, and have scraped together enough money to temporarily deal with said tax and car problems. I lost my first grandparent when I was in seventh grade. My parents woke me up before school, pulled me into the living room, and told me that my grandfather had passed away. He had been in the hospital because he fell off a ladder trying to clean the gutters of his house, and his health worsened after surgery. Of my four grandparents, I was probably closest with him, or at least enjoyed his company the most. He showed all of the grandchildren how to play solitaire and would carve intricate wood sculptures for all of us. His funeral was a solemn affair; it was the first funeral I had ever been to. Before the service, one of my parents, unbeknownst to us, went to the church organ player and requested that as the casket was leaving the church, she play “You Are My Sunshine”. The organist was confused and not entirely sure it was appropriate. My grandpa used to play “You Are My Sunshine” for the family on something that’s like an accordion but not quite an accordion. Last year was supposed to be the year that everything came together for Rich Rodriguez after the disastrous 2008 campaign. There was Tate Forcier, Weapon of Choice. Next came Western Michigan and Notre Dame. By mid-October, a month later, what had looked so promising was a hollow shell. The team was in ruins and needed to start again next year. The weekend that my ex-girlfriend and I broke up was difficult for me. We had been making a long distance relationship work (she in Los Angeles and I in Cleveland) for nearly 15 months and things had started to splinter. I flew to California knowing full well that we had to have a Talk and that it might very well end with us not being together anymore. We broke up shortly after my plane landed. On the last day that I was in California, she and I were getting dinner together at P.F. Chang's--yes, in Los Angeles, where there are certainly better Chinese restaurants, but I digress. After dinner, I cracked open my fortune cookie and it told me, “Remember this date. Three months from now something good will happen to you” (or something to that effect). I’m not superstitious, but this was obviously a good sign as I wasn’t the one that initiated the breakup. A month and a half later, we were having a discussion about her new boyfriend. We stopped talking shortly after that. In two games, more than leading the Wolverines to impressive, imperative victories, Denard Robinson has inspired hope in the Michigan faithful. After two years of endless piling on, there seems to be light at the end of the tunnel. People said that last year about Tate Forcier, but this feels different. You can see it in the childishly playful way Brian Cook, leader of the Michigan faithful, Tweets or the two-part comic strip that Denard’s UConn performance pulled from the depths of his crazies. 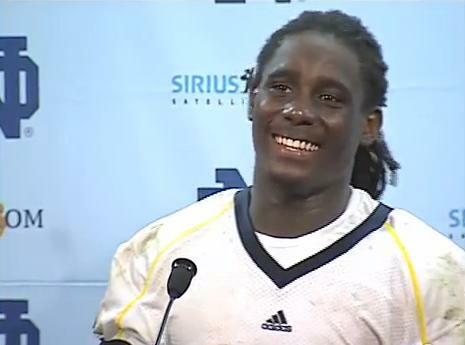 Or in Denard's brilliant smile that everyone who’s seen in him a press conference raves about. Denard is the promise of Pat White, 11-1 conference-winning seasons, contending for a national championship; everything that people have come to know Rich Rodriguez for seems to be possible with Denard. Whether or not that comes to fruition is beside the point. Right now, there’s hope. Through a collection of mutual friends, I now watch football games with my ex-girlfriend. I spend most of the day trying not to look in her direction--which isn’t too terribly difficult as I’m glued to the TV, yelling at random linebackers to tackle people--due in large part to my not being totally comfortable with her there for various reasons. After Denard's performance in the Notre Dame game, we shared a two-handed, over-the-head high five. Welcome to California and may the rest of 2010 be better along with 2011 and beyond. Just stumbled on your site. Love it. I tore through half a dozen articles before getting to this one. I'm a Michigan to LA transplant myself (with many stops on the way). Will not get preachy here... just keep up the great writing. Good things will happen. Good luck and go blue! Glad you enjoy the site. Go Blue! This will be one of my daily stops for my UM Sports fix from now on.